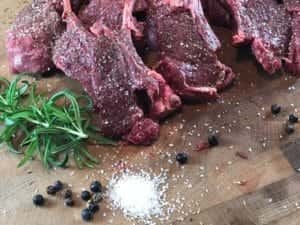 Reindeer meat is fantastic choice for grilling. It is not the cheapest type of venison, but worth of cook every time. This time I bought 2 ½ lb (1100g) box of reindeer cutlets. Rangifer tarandus tarandus is called Reindeer in Europe and Caribou in North America. 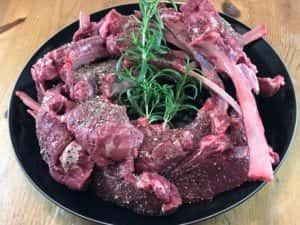 There are number of species of reindeer but my cutlets were from Mountain Reindeer. That is the most common species in Finland. There are roughly 2.000.000 Reindeers in the whole world. 200.000 of them live in Lapland in area covering more than one third of Finland. As a comparison, number of cattle in Finland is 900.000 so Reindeer is not very common in every shop. This box of reindeer cutlets came from special shop called Polarica. Grilling of reindeer cutlets is pretty simple. Season with salt and black pepper only. If you feel adventurous, you might put some rosemary or thyme also. Heat your grill up to 400°F (200°C) and place cutlets on the grate directly above hot coals. Hot and fast, 3 – 4 minutes per side and you are done! Target inner temp for the cutlet is 130°F (55°C). Leave it medium rare and you have a juicy treat.